Deric's MindBlog: Deric's MindBlog on vacation in the UK. I wonder if I might be able to trouble you for your opinion on a matter of personal interest that I would very much value your opinion on. What is your take on the recovery model that is hitting the mental healthcare field by storm? If your at all comfortable, I would very much love to quote you on my own blog, the mental health recovery blog (mental-health-recovery.blogspot.com/), I would of course reference back to you but if you are not comfortable with that I would of course love to hear your thoughts on the matter here! I look forward to talking more with you on the subject! 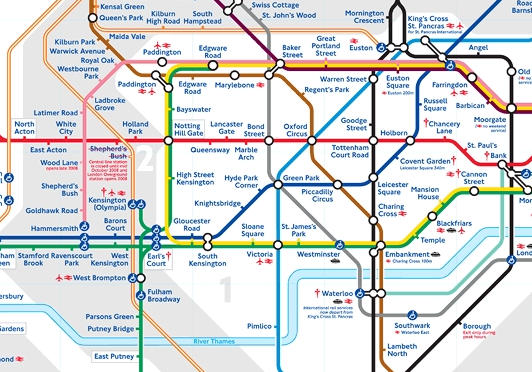 I have always been fascinated about the map of london underground, it was one of the first visualization I learn when I was in college. I guess you know that the proportions are not real, they are distorted to make it for humans more easy to understand at once. Comment back to Lex: The mental health recovery model seems perfectly reasonable to me, anything that tends to keep people out of institutions and off drugs and uses social peer techniques is hard to argue with. I consider anything that is put in my blog quotable, copyable, etc., hopefully with attribution. Well, I travelled to london the last december for vacation and I prefered to book a taxi for my travel rather than going by tube because i find it very confusing one If anyone like me is over there than they can try to book a Taxi with Hummingbird Cars http://www.airportransfers.net. for London airport Transfer and they are pretty good and Affordable. They Provide Transfers from all the five London Airports: Gatwick, Luton, London City, Stansted and London Heathrow Airpots. They have very well behaved Drivers who respect their customers. They also provide a MEET and GREET Service. They have well maintained Saloon, Estate, People Carriers (MPV's) and large Public Carriers. They also dont hike their prices anytime they have standard prices throughout the year. They also provide good discounts on bookings. Even i agree with Chris that HUMMINGBIRD CARS http://hummingbirdcars.co.uk is the best London Airport Transfer company in the town at present. and to add to the above comment they provide 5 % Discount on all return journeys. I think you'll both missed one point they allways on time. Even i have tried Hummingbird cars http://www.hummingbirdcars.com and they are very good.